Something we’ve found very useful when working with clients is getting them to tune into themselves to understand when they are getting triggered. We use the word “triggered” to identify when someone has an emotional reaction which may be unproductive (and is usually based on old patterns), in any situation, and then acts based on that trigger. The best way to start dealing with this is to raise awareness about where the trigger comes from, what is most likely to be a trigger for a particular person, and then, of course, what to do about it. This post is about how to notice things before they blow out of proportion and how to address them – to catch them at the beginning. Must be dealt with while they are yet small. Check disorder before it is rife. Sometimes it helps to understand where triggers come from. Looking to the beginning of our life might be a way to uncover how we operate in the world. But for the most part we can just work with what is here now, and not have to dig to find the origins (if in fact there is even a single cause). Working with the here-and-now we can start with each beginning: the beginning of a feeling, the first thought that arises that is negative, the first sensation that tells us we are uncomfortable. When we get awareness around this then there is a possibility of a different action. A new choice becomes available to us. 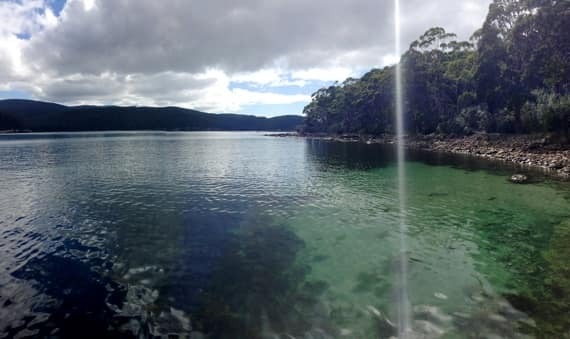 Looking at the picture (above) that we took in Tasmania, we see a quiet perfection. This we could say is our natural state. Many things through a life can pollute our sense of ourselves or the environment and change how we perceive and react to our world. This photo represents for us a canvas on which we project our lives and concerns. If we take stock and can find a sense of our natural state (through therapy, meditation, art) then we can notice the disruptions to this natural state. We can watch for the changes no matter how minuscule they may appear. Attend now. When we see the faintest ripple on the water, check in. If we notice an intrusion to the natural scene, check in. We need to do this with ourselves and, if in relationship, with the other person. You may be interested to read about some practical ways of exploring this internally and in relationship by reading our Three Simple Sentences post and our page on Meanings and Behaviours. Once we understand that there will always be ripples that come and go then we can attend to looking deeper and can make choices to do something different (or just let the ripples settle), rather than letting things build up or reacting too quickly. This is a creative process and it can become a habit that is well worth practicing. We suggest this as an alternative to working on “anger management”; an alternative to feeling disconnected, feeling resentment and experiencing a range of other problems that we see in therapy – when people have just let feelings and thoughts go unchecked and unnoticed. The Tao Te Ching translation is by Lin Yutang.